The Old Testament is filled with intriguing characters, stories and themes. But preaching from its remote historical context wrapped in sometimes unfamiliar literary genres and narrative devices can be daunting. The chapters cover narrative, plot, characters, genre and preaching from difficult texts. The book concludes with a vital chapter on preaching Christ from the Old Testament, which offers a theological account of biblical interpretation without unnaturally forcing the texts. The contributors are internationally respected evangelical Old Testament scholars, from a wide range of church traditions and global regions, who are also active in preaching: Daniel I. Block, David G. Firth, Grenville J. R. Kent, Paul J. Kissling, Alison Lo, Tremper Longman III, Ernest C. Lucas, R. W. L. Moberly, Laurence A. Turner, Frederico G. Villanueva, Gordon Wenham, H. G. M. Williamson and Christopher J. H. Wright. Here is a book that will help you use all of the Bible's rich resources in preaching the good news of the global kindgom of God. "I have found that nothing brings greater joy than preaching the gospel of Jesus Christ from the Scriptures of the Old Testament. This masterful collection of essays will help contemporary preachers understand, proclaim and apply all the genres of Old Testament literature with greater depth and clarity." "There has never been a better time to preach. We have more resources available to guide our understanding of the text than any generation of preachers in human history. But sometimes it feels like we're drowning in information while starving for wisdom. This volume will help create a generation of genuinely thoughtful preachers who can teach people to love God with their minds. It can guide us to preaching that has integrity, power and authority." "This book offers a thorough discussion of the various tasks facing the Christian preacher in proclaiming the gospel from the pages of the Old Testament. Particularly unique among recent treatments of this sort is the fact that each of the contributors is a noted Old Testament professor, scholar and proven preacher in his or her own right. Also, each seeks to encounter the gospel not only within the New Testament but from within the Old Testament as well. The contributors are thus much more inclined to look for their answers to Old Testament problems and hermeneutical guidelines from within the Old Testament itself. Also helpful is the example sermon included with each chapter." "We are fortunate to be studying and preaching on the Old Testament at a time when critical study has produced many approaches to the Old Testament that will aid the preacher. That would have been inconceivable a few decades ago. This volume is a most useful guide to the way those approaches resource preaching on different kinds of texts in the Old Testament." "InterVarsity Press and the team of pastors and scholars who worked on Reclaiming the Old Testament are to be congratulated on producing a much-needed monograph with some very practical suggestions on how to understand the message of the Old Testament. While not every suggestion will be adopted by all, the conversation is extremely important if we are ever going to get back to teaching and preaching the full counsel of God. Laypersons will profit from reading this text as much as the clergy, for each of the chapters hits on some of the major issues of our day." "I wholeheartedly recommend this fine book." "This is a very useful book that no Christian preacher should be without." 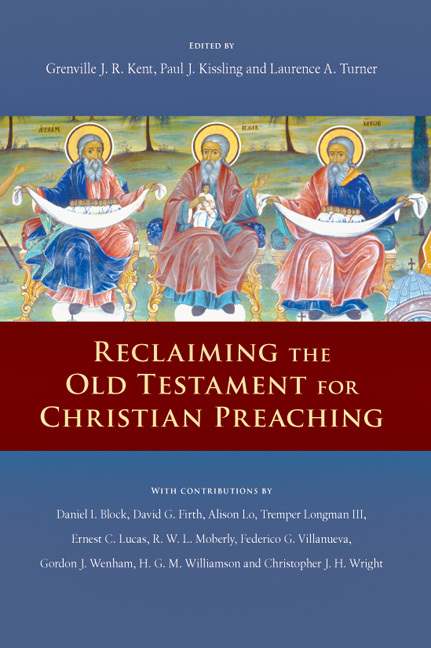 "Given the diversity of the contributors, preachers will find this to be a valuable resource as they seek to be faithful expositors of Old Testament texts."